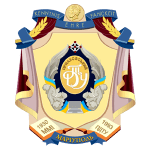 Pryazovskyi State Technical University is one of the oldest educational establishments in Donetsk Oblast. PSTU was certified by ІSО 9001:2008 and has 4th level (the highest) accreditation. PSTU was founded in 1930 as a professional training school for the workers of ILYICH Iron & Steel Works. Originally Mariupol Metallurgical Institute, in 1993 the Cabinet of Ukraine issued Resolution No.956, making it a Technical University. The university has 10 faculties and 45 departments.